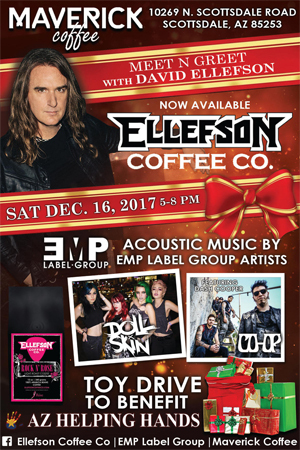 DAVID ELLEFSON’s Ellefson Coffee Co will celebrate new retail outlets with a hometown event SATURDAY DECEMBER 16th, at Scottsdale’s MAVERICK COFFEE. Maverick is the latest retailer to come on board to serve and sell ELLEFSON COFFEE CO Coffee. They will feature the ROCK N’ ROSE blend, ECC’s newest LIGHT ROAST offering, launched in October for BREAST CANCER AWARENESS MONTH, with a portion of the proceeds gong to therose.org, a Texas-based breast cancer awareness charity. The event, which goes from 5-8 PM will feature a meet and greet with Ellefson, as well as acoustic performances by EMP LABEL GROUP’s DOLL SKIN and CO-OP, featuring Dash Cooper, and a toy drive to benefit AZ HELPING HANDS. Says Ellefson, ““Maverick is a terrific cafe that I frequent when I’m home in Scottsdale. I’m thrilled to have Ellefson Coffee Co as part of their offerings. I look forward to seeing you all there for a final year end celebration with two of our hometown EMP Label Group artists!" Earlier this year ECC partnered with IRON MAIDEN drummer Nicko McBrain’s ROCK N ROLL RIBS in Coconut Creek, FL, another ECC Retailer, where David and Nicko jointly hosted an Ellefson Coffee Co event. Additional retail locations include Rock N’ Roll Land in Green Bay, WI, Kat’s Hog Heaven in Jackson, MN, and The What’s Up Lounge in Mankato, MN. Ellefson Coffee Co formed in 2016, and has since sold thousands of bags of its coffees via mail order and retail, including their flagship dark roast ROAST IN PEACE, KENYA THRASH, URBAN LEGEND, and ROCK N’ ROSE.